 Producer Sol Lesser decided to film a lot of his next Tarzan feature in East Africa, hoping to inject greater authenticity and new energy into the series. Unfortunately he was brought undone by poor planning and bad luck - Barker's tan faded in the cloudy, equatorial, winter climate (a problem remedied by the importation of body make-up from Hollywood), local animals were uncooperative, the weather worsened and the original director, Phil Brandon, resigned. Lesser's ambitious plan to make this the very first Tarzan feature shot in colour foundered when most of the colour footage was ruined in an accident. The new director, Byron Haskin, reworked and tightened the script which successfully produced a fast-paced taut drama with mostly excellent dialogue, helped immeasurably by the sumptuous African footage. (Essoe & Fury) Lesser, still searching for the perfect Jane, cast a new actress in the role, lovely Virginia Huston (right). 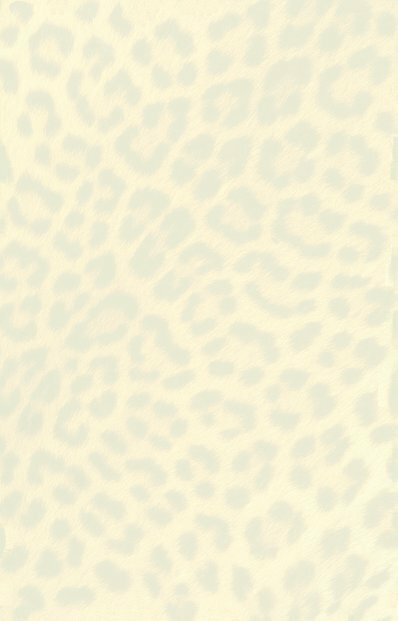 While appealing to the eye, she is not a particularly convincing jungle girl for she completely lacks any spunky tenacity, playing Jane as a timid sweetie.  A band of opportunistic gunrunners, led by the cruel and callous Radijeck, a recent prison escapee, (far right in photo) are selling guns to the local tribes. The outgoing Commissioner warns his replacement of the problem and warns him to be alert. Bulam, king of the Yorango tribe, is keen to wreak vengeance on the peaceful Ashuba tribe because their new queen, the brave and kind Melmendi, has rejected Bulam's marriage proposal. Radijeck, who Tarzan had previously sent to prison for slaving and gunrunning, negotiates a deal with Bulam to supply him with guns to fulfill his desire for revenge on the Ashubas. 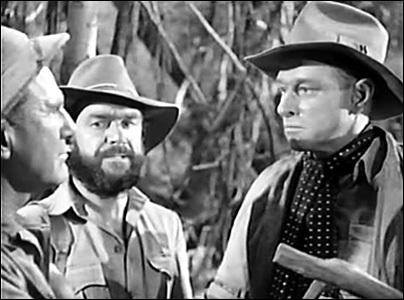 The three gunrunners, Radijeck, Andrews (far left), and Trask (centre) are torn by internal friction and distrust and murder the new Commissioner and his predecessor, who is Tarzan's old friend, when they are confronted by them. Radijeck causes an accident that injures Andrews and leaves him to die in the jungle. Bulam uses his new guns to attack and imprison Melmendi and Radijeck threatens Jane. Tarzan helps to quell the tribal disturbance and rescues Jane, killing Radijeck in the process. • The video clip of the trailer for this film was was provided by Youtuber montrealflickers. Many thanks! 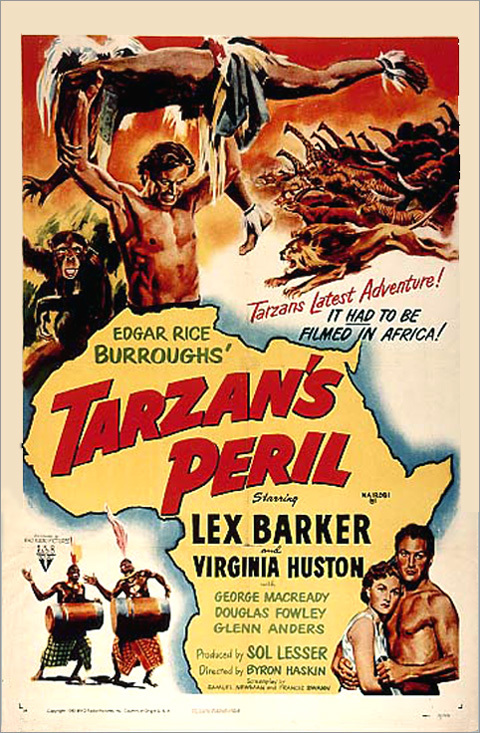 TARZAN® is the property of Edgar Rice Burroughs, Inc., Tarzana CA.